The Spirit Sands Trail in Spruce Woods Provincial Park in Manitoba, Canada is restricted to hiking where the winds whip across the sand dunes leaving behind various patterns. The wind has given these plants emerging from the sand dunes a ride as they have lashed across the surface of the sand leaving swirling patterns. There are various trails throughout the Spirit Sands and when hiking across these sand dunes, visitors should come well prepared. Proper walking shoes, hats, sunscreen and plenty of water are needed especially during the summer months. Plant life should be left untouched and always be wary of cactus, poison ivy and stepping on creatures such as the hognose snake as you hike to the top of sand dunes, some reaching heights of 30 meters. 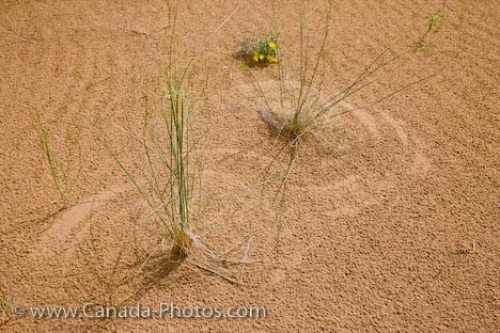 Picture of the plant patterns created by the wind which whip across the sand dunes along the Spirit Sands Trail in Manitoba. Patterns in the sand created by the wind moving plants on the surface of the dunes along the Spirit Sands trail, Spruce Woods Provincial Park, Manitoba, Canada.